The target website is blocking our crawler from accessing it. Please add our IPs to the server's whitelist. Your hosting provider could also be blocking us - in this case, please check in with them to resolve the issue. You should also check if you're using any plugins that could be blocking us. For e.g, the Incapsula plugin blocks us. The target website is blocking our user agent, AhrefsSiteAudit, from crawling. Our bot is currently being blocked and cannot reach your website. This could be due to multiple reasons like: the configuration of your webserver, the firewall managed by your hosting provider, the protection of your CDN etc. The error message might provide hints at to what the cause might be. Some known examples include: ModSecurity, Sucuri, Cloudflare. 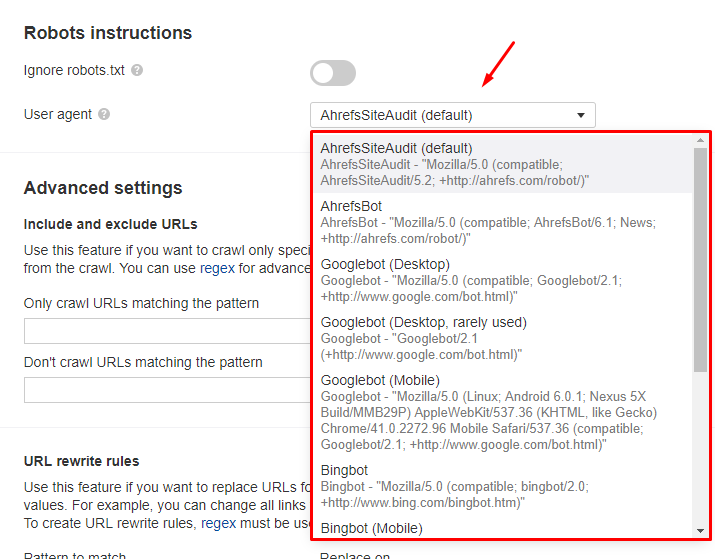 In some rare cases, your crawl might fail when you select the User Agent of a search engine, such as Googlebot, in the project settings (this option is available for the websites with verified ownership only). As you might know, Site Audit allows you to crawl your verified site the way search engines, such as Google or Bing, do. You can use a custom User Agent in the project settings for that. Seeing that this activity might seem suspicious to some hosting providers, they can automatically block Ahrefs' bot by IP. It happens because our bot uses an IP address different from, say, Google’s. In this case, reach out to your hosting provider and ask them to whitelist our IP ranges if possible. How do I finish crawling my website faster in Site Audit?